The Pittsburgh Pirates have been one of the biggest early surprises in the major leagues, winning six of their first seven games following the offseason trades of five-time All-Star center fielder Andrew McCutchen and ace pitcher Gerrit Cole. "We left Bradenton at the end of spring training feeling we had a good team," rookie third baseman Colin Moran said. "We felt we were capable of winning some games." 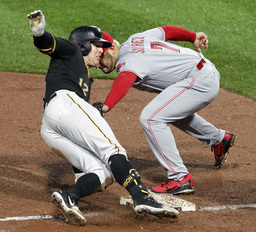 Moran had four hits and three RBIs, and Starling Marte hit a bases-loaded triple to lead the Pirates over the Cincinnati Reds 14-3 on Friday night. Moran's two-run single with two outs in the third inning just dropped in front of diving center fielder Billy Hamilton and put the Pirates ahead for good at 4-2. Marte's triple keyed a six-run sixth inning that included Corey Dickerson's two-run double as Pittsburgh extended its lead to 10-2 while playing through a steady rain. "I've been a position where I've been hitting with men on base and am just trying to take advantage," Moran said. "We have a dangerous lineup one through eight. We have the ability to score runs." Dickerson had three hits, including a triple, and Jordy Mercer had two doubles among his three hits. The Pirates had 15 hits, including two each by Marte and Josh Harrison. Harrison also drove in two runs and Josh Bell drew three walks. Gregory Polanco hit a two-run double during a four-run seventh that made it 14-2. He has six extra-base hits and 11 RBIs in seven games. "You're not going to score 14 runs every night. You're not going to get 15 hits every night," Pittsburgh manager Clint Hurdle said. "However, the quality of the at-bats overall, the focus and the preparation is in a good place and a very consistent place." Trevor Williams (2-0) scattered two runs over 5 1/3 innings despite allowing 10 hits. He pitched six hitless innings to win at Detroit last Sunday in his first start of the season. "It was one of those games that's a little frustrating because you're getting singled to death but fortunately the guys made some big plays behind me and we scored a whole lot of runs," Williams said. Luis Castillo (0-2) allowed four runs and six hits in five innings and has a 9.00 ERA through two starts. His 3.12 ERA in 15 starts last season led NL rookies. "He hasn't been as sharp as we've seen him," Cincinnati manager Bryan Price said. "He's been pulling some pitches across the plate and right into the sweet spot of left-handed hitters. "Still, he was throwing 95-97 (mph) with a good slider and a good changeup, and the Pirates hit him." Jesse Winker had three hits for the Reds, and Joey Votto, Jose Peraza and Castillo added two each. Cincinnati hit into three double plays and stranded 10 runners in losing for the fifth time in six games. Moran and Mercer hit back-to-back RBI doubles in the second inning. The Reds tied it in the third on run-scoring singles by Winker and Votto but didn't score again until the ninth. Clay Holmes, a 25-year-old right-hander, pitched the final two innings for Pittsburgh in his major league debut and allowed one run. The Pirates announced left-handed reliever Kevin Siegrist has been placed on the suspended list at Triple-A Indianapolis for failing to report to the club. The team said Thursday that Siegrist had exercised an opt-out clause and become a free agent. However, Siegrist had a March 29 deadline to opt out and did not at that time. The Pirates announced 99-year-old usher Phil Coyne, who has been working home games for the team since 1936, has retired. He turns 100 later this month. Reds: RF Scott Schebler (bruised right elbow) missed his third straight game. He was injured last Sunday when hit by a pitch from Washington LHP Sean Doolittle. Cincinnati RHP Sal Romano (0-1, 4.50 ERA) is to start against RHP Chad Kuhl (1-0, 6.35) on Saturday night. Romano gave up three runs in six innings against Washington last Sunday, when Kuhl allowed four runs in 5 1/3 innings at Detroit.